Has Your Paver Sealing Job Gone Wrong? To enhance the appeal of a property, homeowners and business owners alike often incorporate pavers into their landscaping. Pavers are typically durable and low maintenance and can last a lifetime if they are taken care of. If they’re neglected, their visual appeal will be diminished considerably. It’s important to seal them correctly to keep them looking their best for years to come. Bad sealing jobs happen when well-meaning homeowners decide to tackle a DIY sealing project. While it isn’t impossible to seal your own pavers, we’ve seen too many DIY projects go wrong. Hiring an unskilled person to seal your pavers is another reason that bad paver sealing jobs happen. You may assume a handyman knows how to seal pavers but this may not necessarily be the case. In both scenarios, the use of inferior products or applying good products incorrectly can lead to a botched job. When your pavers aren’t sealed properly, you’ll need to call in a specialist for a paver sealing service in Land O Lakes to restore them. Pavers turn white for different reasons, but ultimately it could be due to using a cheap acrylic sealer or over applying the sealer. When you over apply sealer this traps moisture under the sealer and causes it to turn white when water gets trapped. If you’re noticing a black, brown, or green-like slime substance growing on your pavers, this is mold or algae. Mold and the like grow in damp and shaded areas. It’s likely caused by poor drainage which keeps the area moist. Combine that with a lack of sunlight and you have an unsightly set of pavers on your hands. The color pigments of your pavers can fade over time due to exposure to the elements. Sealers are meant to draw out the colors and contrasts of pavers and can also give your pavers a “wet look” too. If improperly sealed, your pavers will not be protected from extended exposure to the sun. Properly sealed pavers keep stains from easily penetrating the pavers. 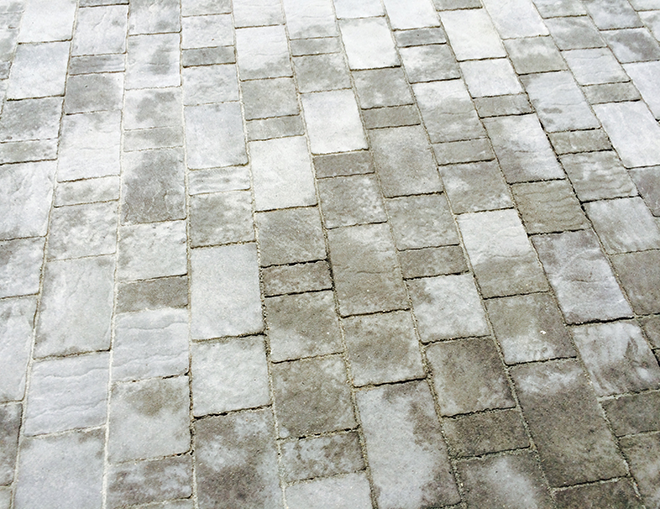 Sealer helps make pavers less porous which keeps them from soaking up oil, dirt, and other stains. Always hire a qualified paver sealing contractor by checking references and licenses. Avoid applying the sealer before cleaning the area making sure to remove all signs of efflorescence. Never apply sealer to a damp or wet area. Also, after a sealer is applied, never apply a second coat of sealer before the first coat has dried..
To schedule a paver restoration in Land ‘O Lakes, please fill out our contact form or give us a call at 813-333-1709.